The Las Vegas of today is a fun zone not only for gambling adults but for children and families of all ages. If the thrill of putting your money on the table doesn't lure you, then the thrills of roller coasters, pirate ships, simulator rides, and arcade games will keep you and the kids entertained for days. Mini amusement parks abound in Las Vegas now, as it promotes itself as a family adventure. The first hotel to cater to the non-gamblers and youngsters was Circus Circus in 1968. Now that hotel has a 399 space RV park and Adventuredome - a five acre indoor theme park. The under 21 crowd can also enjoy the amusement park at the MGM Grand complete with log ride, roller coaster and bumper boats, or view the "Lion Habitat" to see big cats up close. Some of the rides are not for the faint of heart like the "Big Shot" on top of the Stratosphere, the "Manhattan Express" at New York New York or "Speed, the Ride" at the Sahara. The casino's are great attractions themselves with the "city scapes" of Paris and New York, the elegance and musically choreographed fountains of Bellagio, and the fun and wild atmospheres of Treasure Island and Circus Circus. Some casinos cater more to families by offering kids fare food, like Treasure Island and New York New York, but Bellagio charges the same fare for kids as adults. Every major hotel also offers babysitting services with licensed, bonded experienced sitters for a price, so the adults can go enjoy the night life. 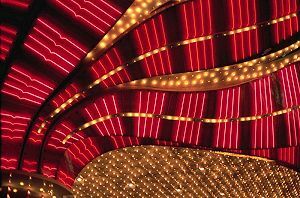 There is something for everyone at Las Vegas today, including the old fashioned gambling that attracts millions each year. The United States' 36th state, Nevada, was admitted to the union on Oct. 31, 1864, a date that is now a state holiday. Now famous for legalized gambling, Nevada has the highest population growth rate in the United States and is one of only seven states that does not levy a personal income tax. Nevada is home to two mountain ranges, the Sierra Nevada range and the Rocky Mountains, and the Sonoran and Mojave deserts. This sunny state sees only about four inches of rain per year and enjoys mild winters with an average daily temperature of about 60 degrees. However, the months of July and August see average temperatures of about 105 degrees with a great deal of humidity. After the legalization of gambling in 1931 and the reduction to six weeks of the residence requirement for divorce, Nevada became a marriage, divorce and resort center. The most popular tourist centers are Las Vegas, Reno and Lake Tahoe, with the Las Vegas strip hosting approximately 30.5 million tourists annually. Tourism is a dominant industry in Nevada, employing over one-third of the working population and contributing more income than mining, agriculture and manufacturing combined. In addition, Nevada has the distinction of legalized prostitution in some counties within the state.